It’s getting hot already here in AZ, and who doesn’t like ice cream? 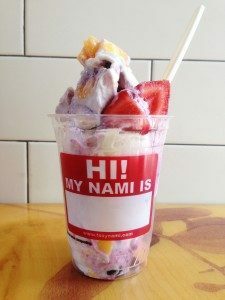 Especially dairy-free ice cream called tSoynami… and especially, a one-time-only exclusive flavor created just to support Plea for the Sea’s efforts to end dolphin captivity and save the oceans. We’re excited to partner with Green New American Vegetarian restaurant for a fundraising event on Earth Day. The chefs at Green have dreamed up a delicious flavor (you’ll have to show up to taste it!) and are generously donating 100% of the proceeds from the sale of this tSoynami to Plea for the Sea. Come out and join us on Saturday, April 22 anytime between 2:00pm and 8:00pm and buy a tSoynami and support our cause. We will have Plea for the Sea items and more, and live music from The West Hills Brothers will begin at 6:00pm. Come out for a late lunch or dinner and stay for tSoynami for dessert. We’ll see you there! The Beauty of Orca Whales in the Wild!